Beyond ourselves is what we Christians should be – what the whole world should be – as the Church’s celebration of Advent enters its final week. For the mystery of the Father’s divine love is about to be revealed in its fullness and made visible to the whole world in His Son, our Savior, the Lord Jesus Christ! “O shepherd of Israel, hearken, from your throne upon the cherubim, shine forth…” (Ps 80:2) – the psalmist chimes in joyously. This morning, I had just bought a cup of Starbucks coffee when a long line of youthful Christmas carolers streamed into the shop unexpectedly, wearing red and green Christmas outfits and singing Twelve Days of Christmas. There must have been more than 20 of them, crowding up the stairway to the upper floor of the shop, giggling and making funny faces as they went from one carol to another. O what fun that was to be caught unexpectedly in such Christmas festivity! A little beyond myself, I also giggled and sang along with them. And why not? Even John the Baptist, the infant in Elizabeth’s womb, was leaping for joy at the moment the sound of Mary’s greeting reached Elizabeth’s ears. So children and adults, young and old, the whole world all over, let’s giggle and sing. “For God so loved the world that he gave his only Son, so that everyone who believes in him might not perish but might have eternal life” (John 3:16)! If we pay close attention to the references in the Old Testament, Mary’s visit to Elizabeth could surely nourish our faith. The Jews of that time like today’s, when they meet, they greet each other: Shalom-Peace. Prophet Isaiah called the Messiah, the “Prince of Peace” (Is 9:5). On the lips of Mary the word “peace” is a solemn proclamation. It is the announcement that the awaited Messiah has come into the world and with him the reign of peace spoken of by the prophets has begun. Later the angels would sing “Peace on earth to those whom God loves” (Lk 2:14)—today the disciples of Christ speak only words of peace. “Whatever house you enter,” Jesus recommended, “first bless them, saying, ‘Peace to this house’” (Lk 10:5). 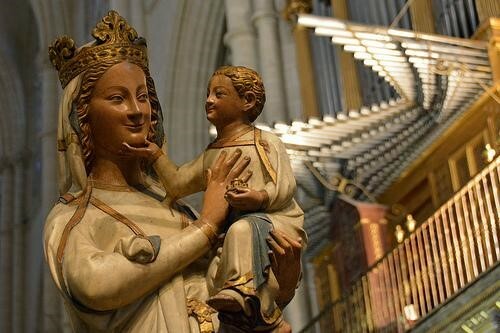 Elizabeth says, “How is it that the mother of my Lord comes to me?” (v. 43). It was uttered by David on a very solemn occasion, when the ark of the covenant in which he believed the Lord was present was transferred to Jerusalem. In receiving it, the king exclaimed: “How can the ark of the Lord come to me?” (2 Sam 6:9). Both Mary and the ark remain three months in a house of Judea. The ark is received with dancing, shouts of joy, songs of celebration and is a source of blessings for the family that welcomes it (2 Sam 6:10-11) and Mary entering the house of Zechariah, causes the young John to leap for joy. Anywhere Mary—the new Ark of the Covenant—comes, there is an explosion of joy: the Baptist leaps for joy, Elizabeth shouts for joy at being visited by the Lord and the poor rejoice because the time of their liberation has come. It is joy that characterizes the messianic times. “Blessed is she who believed.” This is the first beatitude that is encountered in the Gospel of Luke. Take note that it is formulated in the third person (not Blessed are you …). This indicates that blessedness is not reserved for Mary, but extended to all who trust the word of the Lord. The same blessedness is found at the end of John’s gospel. The Risen Lord addressed Thomas, “Happy are those who have not seen and yet have come to believe” (Jn 20:29). Authentic faith—that which Mary shows—does not need visions, demonstrations, and verifications. It is based on listening to the Word and manifests itself in an unconditional adherence to this Word. The Gospel passage ends with the Magnificat. Mary is the first to realize the wonders worked by the Lord and sings them. God turns his eyes to those who count for nothing, despised, barren, unproductive, and in a pitiful state. Mary understood that God’s gaze is not drawn by merits or spiritual perfection, but by human need. He places himself among the poor and interprets their feelings of gratitude. Previous PostDramatizing the liturgy of the Word?